This pirate skull cake was requested by my 6 year old son. He wanted a skull cake, but I did not like the molds from the store. So I used a foam Halloween skull that we have for decoration and covered it with plastic wrap and then several layers of aluminum foil. I pressed the foil into all the crevices and indention’s and pulled it all off. I threw away the plastic wrap and was left with the front half of the skull as a home made cake pan. I made the cake and baked it face side down (obviously) in the mold. Once cooled it came right out. I used butter cream frosting and food coloring to make all the details of the skull. Marshmallows were used for the teeth. It just did not look complete, so I made a bandanna out of fondant and brushed it with water tinted with black food coloring. I then added an earring and candy rocks. My son loved it. 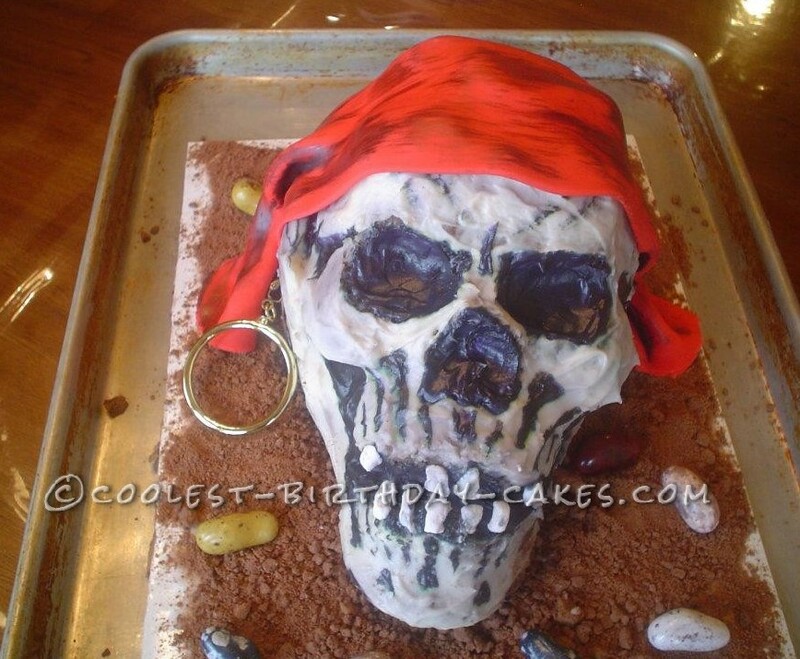 The only regret was not making the skull out of red velvet cake!